After installing, configuring and training SOPARE, you want naturally do something with the recognized results. I run some installations where SOPARE turns lights on and off, controls a magic mirror and a robotic arm. With my voice. On a Raspberry Pi. Offline and in real time. How does that work? Glad you are asking. 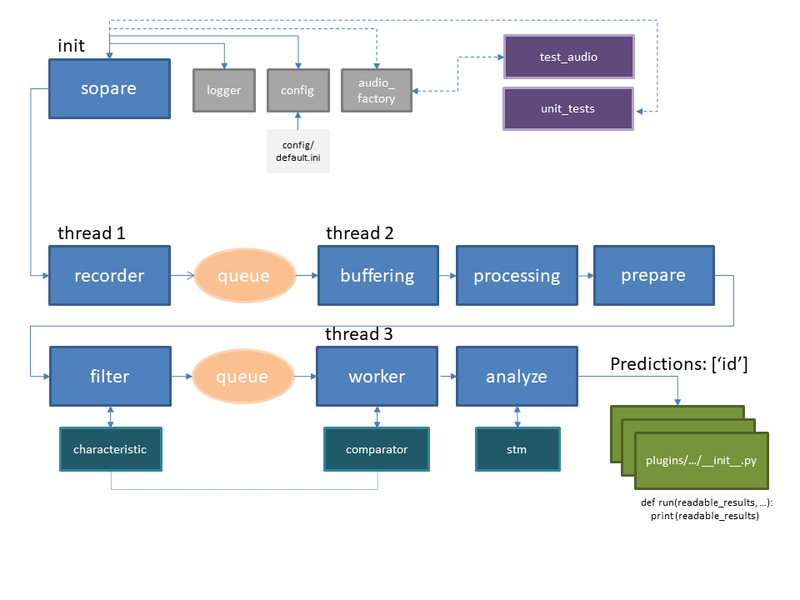 This post should give you an overview about SOPARE in terms of the architecture and provide some insights how to write your own custom plugins for further processing. 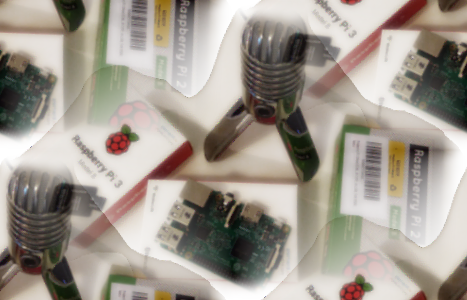 SOPARE stands for SOund PAttern REcognition and is a Python project developed on and for the Raspberry Pi. The goal is to provide offline and real time audio processing for some words that must be trained upfront. As SOPARE is able to learn sounds from training sessions SOPARE is able to identify the same sound later on even under different circumstances. This means that you can train words in any languages. Or just sounds like doorbells, knocks and whatever you want. Of course, there are limitations. However, SOPARE provides a simple plug-in architecture for further processing. Here are some real life operational areas: SOPARE runs 24/7 and controls smart home things like lights (on/off), a magic mirror (wake up, change views, …) and another installation controls a robotic arm via voice commands. The source code and even more information is available on GitHub. Now let us start with the hardware requirements. You need a computer. Yep, seriously. As SOPARE was developed for and on a Raspberry Pi we go with this one – even if SOPARE runs on other hardware as well. Make sure that the hardware comes with a multi core processor. This means Raspberry Pi 2 or 3. Please note: The Pi zero was not tested and could be too weak even if the „0“ comes with 2 cores. SOPARE does not run on older hardware like Raspberry Pi B or B+ due to the lack of multi-core processors. Of course, you need a power supply and a micro SD card if you go with the Raspberry Pi. Then you need a microphone. Maybe some USB-mic. The microphone is extremely important and should fit your own requirements. 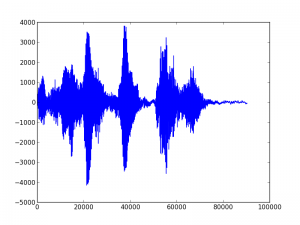 For example: If you want speech recognition across a large distance (more that 1 meter) you may find out that the cheap USB-mic for 5 Euros does not do the trick. But if you plan to speak directly into the microphone the same mic could do the job just perfect. I’m using different microphones for different environments and requirements. That’s it for the hardware. Now let’s talk about software. SOPARE should run on every Raspbian version that is out there. The latest version is Stretch. All of my Raspberry Pis are running the „lite“ version without a desktop UI. But this is up to you and you can choose whatever you prefer. There is some good information available how to download, install and configure Raspbian. I don’t cover this topic as it would get out of hand. 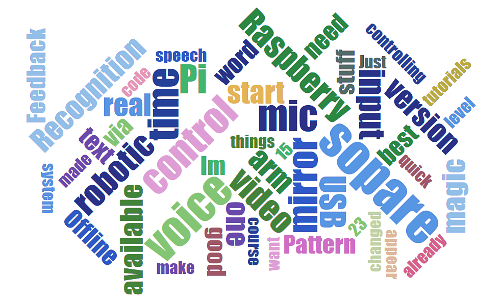 SOPARE stands for SOund PAttern REecognition and it is a Python program that provides offline and real time voice recognition on a Raspberry Pi or alike. The source code is available. Read more. Many things have changed since the last video tutorials were made. You will notice that the configuration file changed and moved to another location. In addition, the text „start endless recording“ does not appear as promised. If you want the text to appear you can change the log level to „INFO“. The plan is to create a new, updated tutorial with lots of interesting stuff inside. There is already some feedback available from the former tutorials (e.g. make the console text bigger or better readable, start from scratch video, …) and I’ll do my best to consider that. However, if you have ideas or special requests please do not hesitate and write a comment to let me know. Happy voice controlling and have fun! Whoa, it’s about time to talk about accuracy and precision in terms of SOPARE. 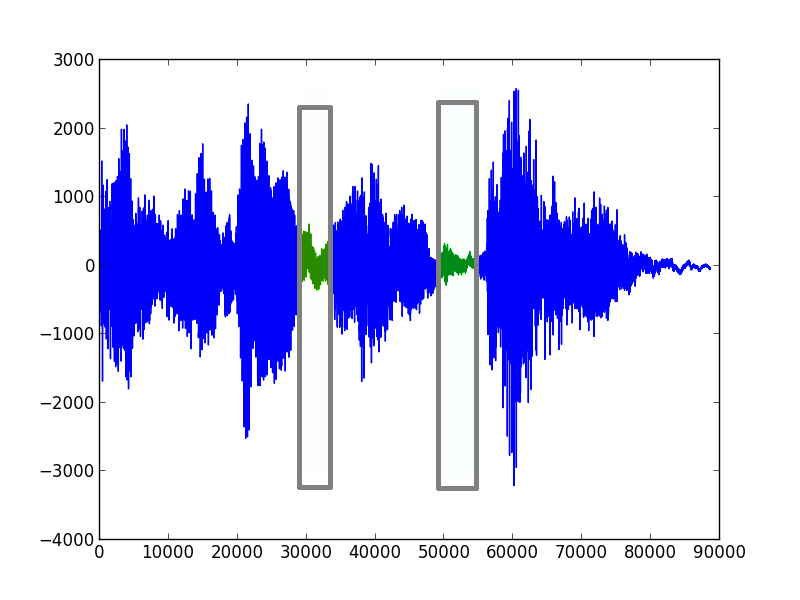 SOPARE is a Python project that listens to microphone input and makes predictions from trained sounds like spoken words. Offline and in real time. Before we go into the details we make a quick excursion how SOPARE is processing sound. The microphone listens permanent and records every sound in small chunks. As soon as the volume of a sound reaches a specified threshold, SOPARE adds some small chunks and creates a bigger chunk. At this time, SOPARE has an array of data in raw mic input format. 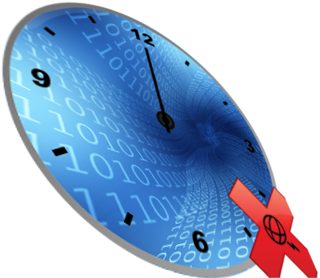 The input receives some filtering (HANNING) and the time domain data is transformed into the frequency domain. Now SOPARE removes unused frequencies as specified in the configuration (LOW_FREQ and HIGH_FREQ). At this stage SOPARE is able to compress the data (MIN_PROGRESSIVE_STEP, MAX_PROGRESSIVE_STEP). Compression is a big factor of precision. 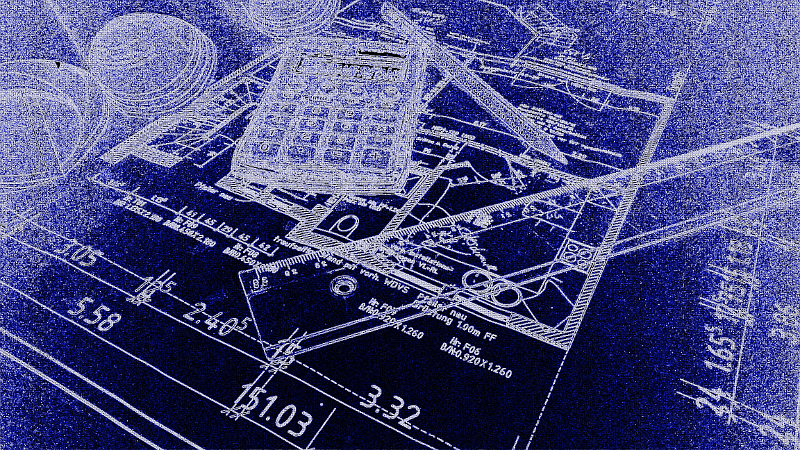 Progressive steps mean that a number of frequencies are combined into one value. A progressive step of 100 takes 100 values and creates one (1) combined value. This is a very rough preparation and a good way to create lots of false positives. The opposite would be a step of one (1) which would use each frequency for the characteristic and prediction and represents the max. accuracy – but maybe also the worst true positive recognition. 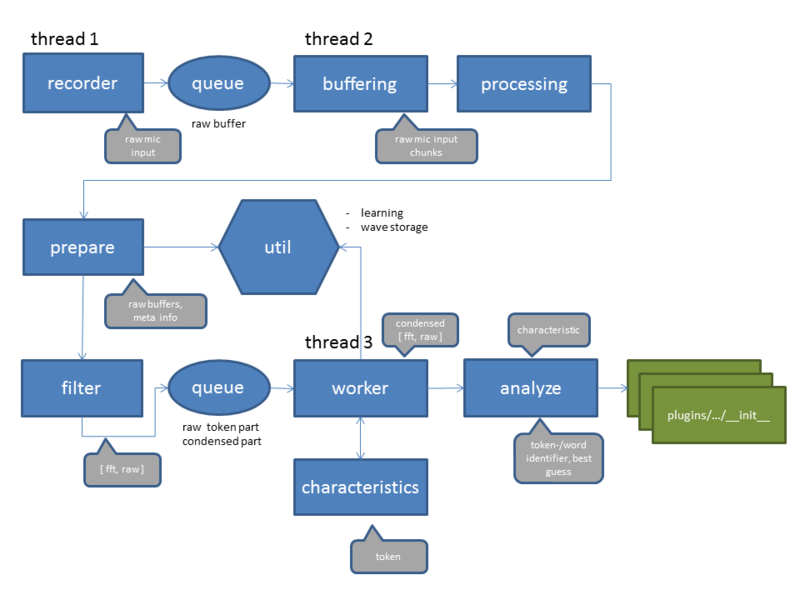 This is how the process looks like. From the full blown time domain data (40000), to the specified number of frequencies (600) and at the end there is a compressed set of data (24) which is quite clear and used for the predictions. You need to test around and find some good values for your setup and environment. If you have optimal values, train your sound patterns. Now let’s talk about options to enhance precision and accuracy. First of all, you should note that one identifier is always susceptible for false positives. Checking for two or more patterns/words increase the precision big time. The marginal value can have a range between 0 and 1. Zero (0) means that everything will be identified as the beginning of a word, 1 means that the trained sample and the current sound must match 100%. Good values lie between between 0.7 and 0.9. Test around how high you can increase the value while still getting real results. For testing purpose keep this value quite low. is the option that is used for comparison. Again, 0 means everything is a match and 1 means that the trained pattern and the current sound must match 100%. For one word scenarios, this value can be quite high, two or more words require normally lower values as the transitions from two patterns are most likely not as single trained words. Good values in my setups are between 0.6 and 0.9. 0.9 for single words, lower values for multiple word recognition. Again, this requires some fiddling around to find the optimal values that gives true positive and avoid the false ones…start with high values and reduce until you are satisfied. In my smart home light control setup the values are around 0.3 and my false positive rate is near zero although SOPARE is running 24/7 and my house is quite noisy (kids, wife, …). „SIMILARITY_NORM“ is the comparison of the FFT similarity. „SIMILARITY_HEIGHT“ compares against the time domain shape. Good if you want to consider a certain volume. „SIMILARITY_DOMINANT_FREQUENCY“ is the similarity factor for the dominant frequency (f0). In the last post I did a quick sopare intro and we controlled a robotic arm via voice. Today I want to focus on simple one word commands and how to add custom features to sopare. 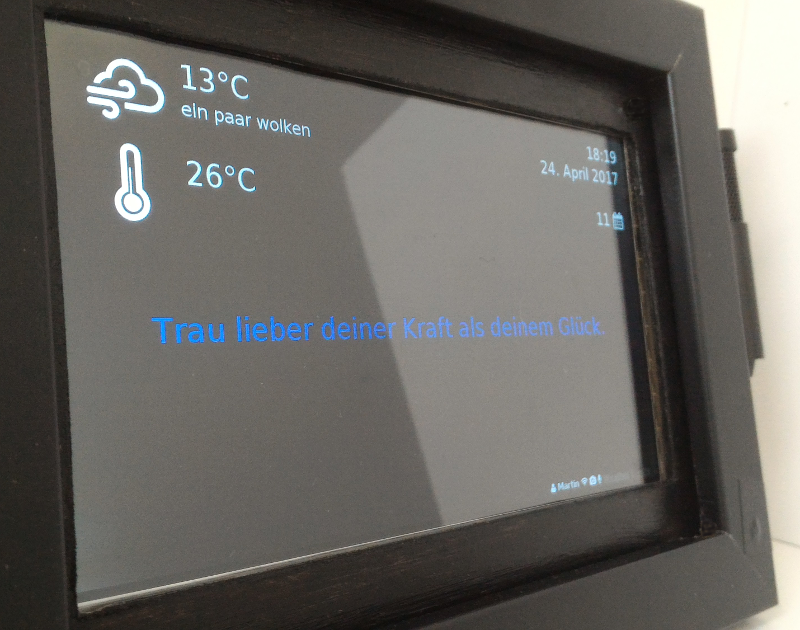 And because I need something to control I use a smart mirror web interface which is one of my next projects I’m working on. It’s not yet a mirror but the frame, screen, a usb mic and some more parts are already assembled and I think this is a perfect example how to use sopare with one word commands. Yes, I must admit the test phase went longer than initially thought. But good things take time, right. When one develops a speech recognition software or a pattern detection system stuff can go horrible wrong and the learning curve potentiates at some point. But anyway, what the hell am I talking about? In a nutshell about SoPaRe. 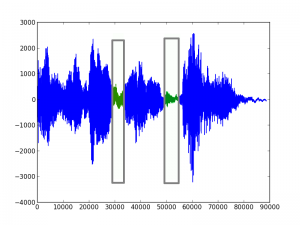 Or the SOund PAttern REcognition project. With Sopare and a Raspberry Pi (technically it works on any Linux system with a multi core environment) everybody can voice control stuff. Like lights, robotic arms, general purpose input and output…offline and in real time. I may prepare some more tutorials about fine tuning, increase precision and the difference between single and multiple word detection. Let me know what you are using Sopare for, what’s missing or about potential issues. I must admit that I did not expect much trouble as it’s only data processing. Well, I changed my view and learned a lot. My current result is a first usable system that is able to learn sounds (in my case words) and recognize them even when I not talk directly in the microphone but from 2 meter away and from different angles. But let’s start with some basics. The following image shows the printed result of me saying three words: „computer light off“. In the current version even a single word is parted into smaller parts like „com-pu-ter“ and for all this parts a characteristic is generated. These characteristics can be stored for further comparison. I tried quite some stuff but I get decent results with a combination of a condensed fast Fourier transformation and rough meta information like length and peaks. The current version is able to not only match learned words in a sentence but also does this is a real environment. This means standing in a room and the microphone is somewhere located in the corner. Or speaking from quite a distance. On the other hand I still get false positives as the approach is rough. But I’m quite happy with the current state that’s why I talk about it now. The project (SoPaRe) incl. the source code is located on GitHub. 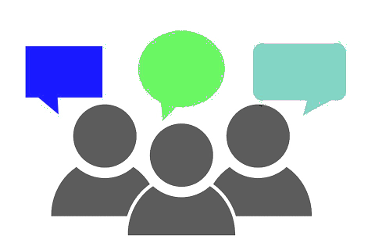 Happy to receive your feedback or comments and of course, if you are using SoPaRe, please tell me about it!